To make the aioli, combine all ingredients in a small serving bowl and mix to blend. Taste for seasoning and chill until serving. Preheat the oven to 275 F. Rub both sides of the salmon with the seasoning and olive oil, and sprinkle with the lemon juice. Place the salmon, skin-side down, on a nonstick or foil-lined baking sheet. Roast for 26 to 32 minutes, depending upon the thickness, until flaky and just cooked through. The salmon will appear very moist. If serving cold, let the salmon cool in the pan. Transfer the salmon in one piece to a serving platter using spatulas. Or cut the salmon into serving pieces and arrange on a platter. Either way, garnish with parsley and lemon slices. The salmon can be cooked and refrigerated up to 1 day before serving. The sauce can be prepared, covered and refrigerated for up to 3 days before serving. Add 1/2 cup of chopped European cucumber to the aioli. Replace the mayonnaise in the aioli with 1/2 cup of light mayonnaise and 1/2 cup of yogurt to lighten it up. Use the salmon to top mixed greens and cherry tomatoes for a salmon salad. 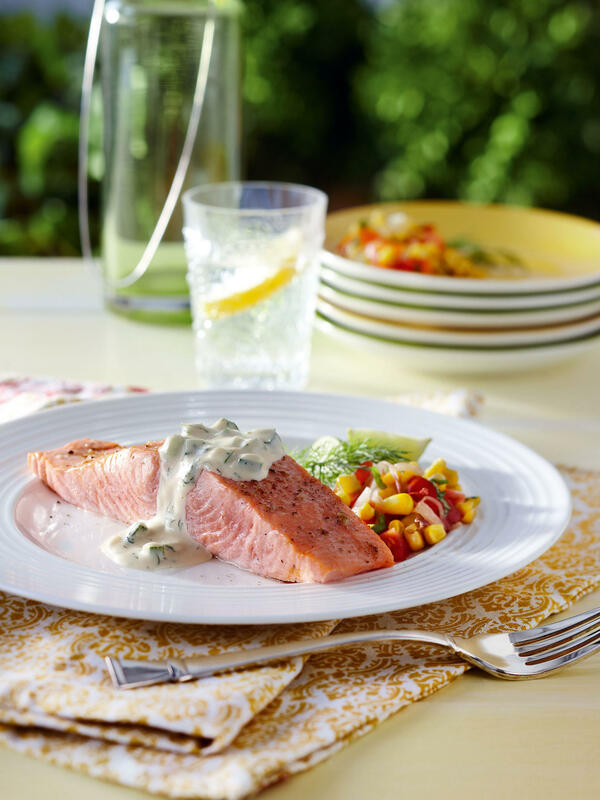 Accompany the salmon with a fresh summer salsa made with sauteed fresh corn kernels and shallots, basil and raw chopped tomato. Double the recipe for a large party and serve the fish fillets one at a time. When the first platter starts to look messy, switch it out for the new one. Serves 6 as a main course and up to 12 for a large buffet with other dishes.